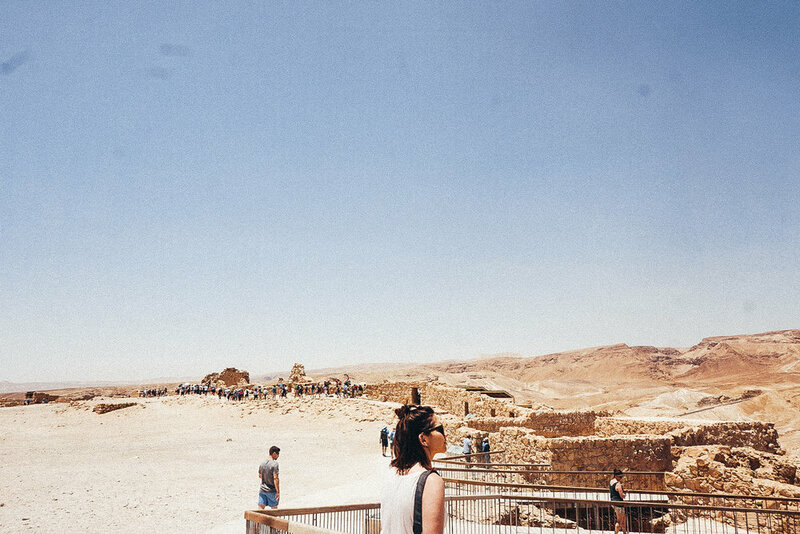 Israel already feels like a lifetime ago, but a few memories still stand out particularly fresh in mind. Many of you know I am a Christian, I believe in God/Jesus/Holy Spirit… the whole deal. Growing up my dad was always an example of someone who really listened to God… I mean like, REALLY LISTENED. To this day me, and a somewhat random collection of dozens of his friends and family will receive his daily text mini-sermons – (littered with typos and in ALL CAPS), or he will frequently call to tell me a story of how the Lord told him something of significance that day. I actually have some crazy stories from my childhood where ‘the Lord told my dad to do something’ and one instance actually saved my life (involving a tree falling on our house growing up). Probably because of him… I feel like I’ve inherited some of his weird spiritual inclinations or premonitions or whatever. He just always emphasized the importance of listening and I think ever since I can remember I’ve just really spent time trying to hear. This has likely resulted in me being more of a spiritually inclined person than religiously inclined…the pros and cons of which are things I’ve debated in my head many times over. 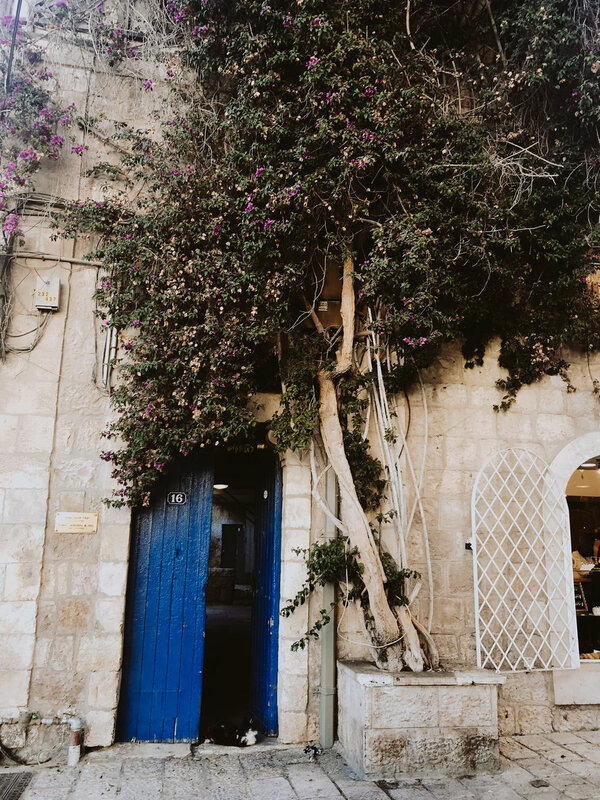 When mentally preparing for Israel I really felt like I was going to grasp religion in a way that I hadn’t been able to. I thought that because I was going to where Jesus was, the place where the stories I had heard all my life actually happened, that I would be inspired to become more religious. I’d be inspired to read the Bible more, seek out a church community and my faith would be changed in its entirety. Being in Israel, visiting site after site, I noticed that I wasn’t feeling as compelled by my religion as I had hoped. I didn’t know if I should be disappointed or concerned but I decided to digest that when I got home. I had so much more to see and do that I didn’t want to make any decisions or formulate any opinions prematurely. 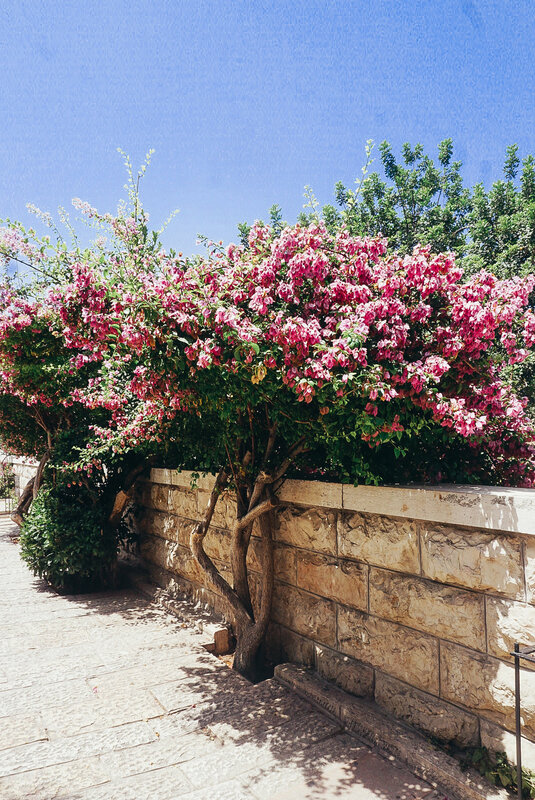 Our first few days in Jerusalem were incredible and a few of my favorite. We visited Bethlehem and the Church of the Nativity (the birth site), the Church of the Holy Sepulcher (where Jesus was crucified), the Garden Tomb (where some say Jesus may have been buried), the Chapel of the Ascension (where he rose into heaven) and many, many, other sites. 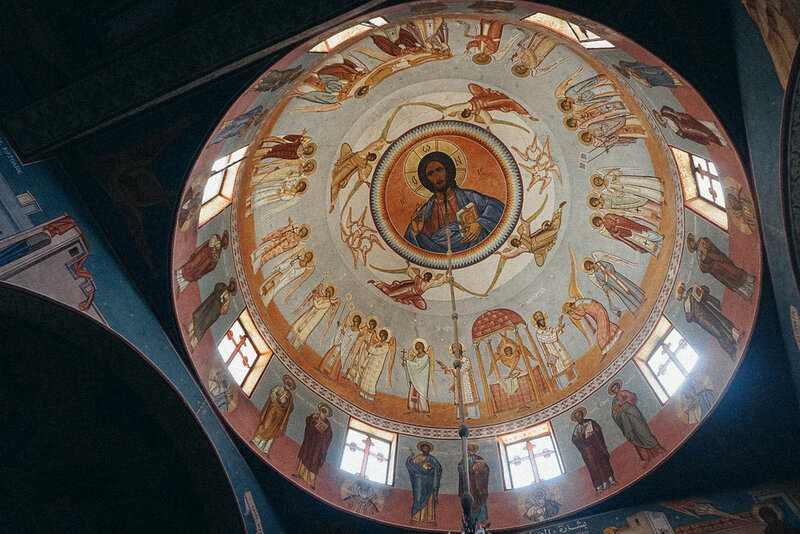 In all of these places I was expecting an emotional reaction, a spiritual experience, a place to really solidify religion’s place in my life but at the end of each day, I was filled with new knowledge, but left longing for a spiritual experience. I was tired, happy, but tired. Our last morning in Jerusalem, for some bizarre reason, I woke up singing a song we sang as kids in Sunday school. And said, ‘Zacchaeus you come down! For I am going to your house today! I really had no idea why I was singing that song and how it got stuck in my head, but there I was humming along while getting ready and packing since we were leaving Jerusalem and heading to Galilee that morning. In fact, I didn’t think anything of it at all. And eventually I just stopped thinking about it all together. After breakfast we packed up our van and headed to Masada. We visited Masada in the morning in an attempt to beat some of the desert heat and finish our day at the Dead Sea for a float (the lowest dry land on earth… like 1,300 feet below sea-level). After our float (note: float not swim… it’s too salty to really swim… you just bob up and down), our guide suggested we stop by his home in Jericho and see the city since it was also a place of significance – given it’s one of the oldest cities on earth. It wasn’t on our itinerary, but it was an opportunity we didn’t want to miss so we decided to do it. We were spending a lot of time traveling by car this day, so I had some more time to dwell on the whole ‘wanting a spiritual experience’ thing. By this point I was feeling like maybe I was not as in tune with my faith as I should have been or could have been, making me second guess my connection with my faith in general. I was beginning to feel like Zacchaeus climbing a sycamore tree, just trying to get a glimpse of God. I smiled to myself because I had spent that morning singing that old Sunday School kids’ song about Zacchaeus and I immediately felt at peace. Just like Zacchaeus didn’t need to climb a tree to see Jesus I realized that I don’t need to go find Jesus in these historic sites or in religious traditions because He is everywhere, even on the side of the road. He was with me in Israel, He is with me at home and He is no less with me here than He would be there. He was asking me to come down from the Sycamore tree. Visiting these places, for me, was not how I was going to feel or see Jesus, I was climbing the tree for no reason. Jesus was noticing me even when I was just standing amongst the crowds. And not that religion or faith is always about this… but there was my “aha” moment, a connection with my spirituality and my religion. Before leaving for this trip to Israel I was told one of two things: I was going to love it or the question of, "are you going to be safe?". To be honest, I had no idea what to expect because I knew very little about Israel. My in laws were the ones who planned the trip and I figured they wouldn’t take all of their kids on a dangerous vacation and they arranged for a private guide so we were going to be as safe as we possibly could be... so I just told people, "of course we will be safe" and "I am sure I will love it." We arrived in Israel later than planned due to delayed flights (no surprise there). We got in a little after midnight I believe and as soon as we got off the plane I was hit with a wall of humidity that is familiar and nostalgic. It smelled and felt the same as getting off the plane and visiting the Philippines to see family as a child or going to Belize on my honeymoon or Mexico with my best friends. Thus far in my life, just about all good trips start with that immediate sensation of humidity. We were escorted to border control to check our passports and we were eagerly awaiting our Israel stamp. When one of us asked if we actually get a stamp the border control agent said, "no" so we asked, "why". Apparently Israel no longer issues stamps because they do not want to leave any evidence in our passport that we spent time in Israel. They do this in case we want to travel to other predominantly Muslim countries that don't exactly get along with Israel. Instead they gave us a card that we were not to lose and we were to keep on us at all times - this was our proof that we were permitted to be in there. After getting through customs and retrieving our luggage we met our sleepy driver at his van and began the hour drive to Jerusalem. The sleepiness started to hit me immediately as I began to doze off minutes into the drive… and apparently our driver did too. Unbeknownst to us kids, the parents started talking to the driver, asking him alllll the questions which seemed to be more irritating than friendly. We found out later the next day it was their desperate attempt at keeping him awake and alert. 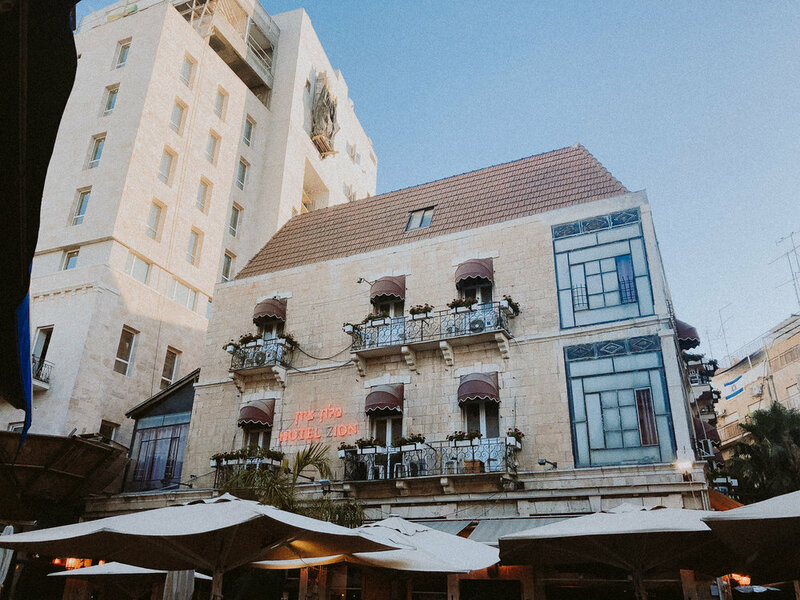 We got into Jerusalem around 2 AM and the city streets were basically empty and our hotel looked like it was unoccupied. We got dropped off at the back door and found someone to open it for us then headed to our rooms after checking in. I laid in bed and found myself wide awake. Between the buzz and excitement of travel mixed with the jet lag, sleep felt hopeless. I managed to eventually close my eyes and rest only to wake up four hours later for breakfast. The breakfast of champions at the Samual Herbert Hotel. 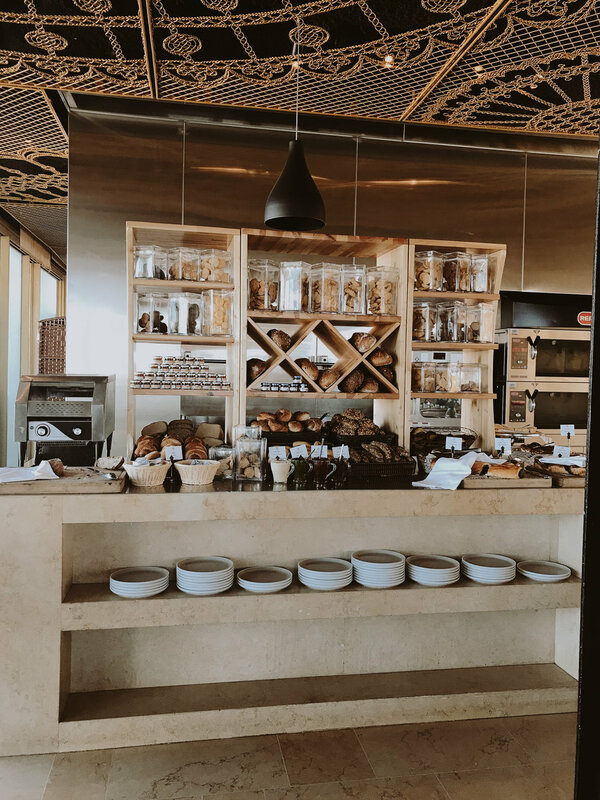 Our first four nights we stayed at the Herbert Samuel Hotel and let me tell you...breakfast there was incredible. It was a mix of fruit, yogurts, pastries, desserts, hummus, meat, fish, eggs and other Israeli dishes...and everything was good. After eating our first meal in Israel we went our separate ways to gather our final things before meeting our guide downstairs in the lobby. Our guide was Daniel and little did we know how close we would all get after our seven days together. The first thing on our itinerary was going to the Israel Museum to see the Dead Sea Scrolls. (Click on the link if you are like, "what the heck is that??"). 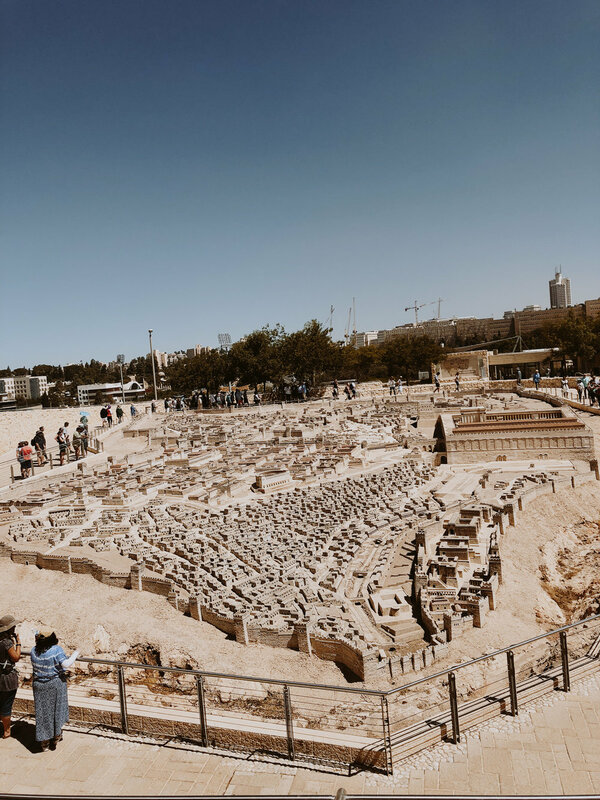 We also saw an incredible (model replica) of the city of Jerusalem and this is where Daniel explained to us the history of how the city evolved over time. Being such a hot spot for religious conflict and rich history there was a lot of information which left me confused, overwhelmed and frustrated with the sudden realization of how little I knew. An overview of Jerusalem from the Israel Museum. Our guide Daniel is a wonderful story teller and he took us through the history of Israel using this mini version of Jerusalem as a visual. 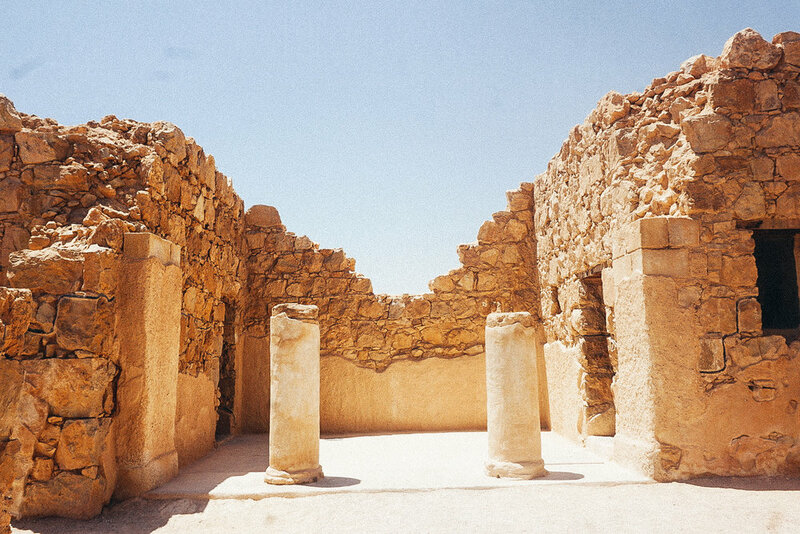 After tracing the path of where Jesus walked and showing us how the city walls/dimensions are almost opposite what they were 2000 years ago, we went inside the museum to see artifacts and architectural wonders of palaces and temples built centuries ago. We also saw the Dead Sea scrolls and learned about how they were discovered in the Qumran caves. Daniel told us that his best friend's grandfather, Kando, the local antique dealer of the time was the one who bought the scrolls. In an antique shop in Bethlehem you can find the biggest vase found in the Qumran caves, for the family antique business lives on! 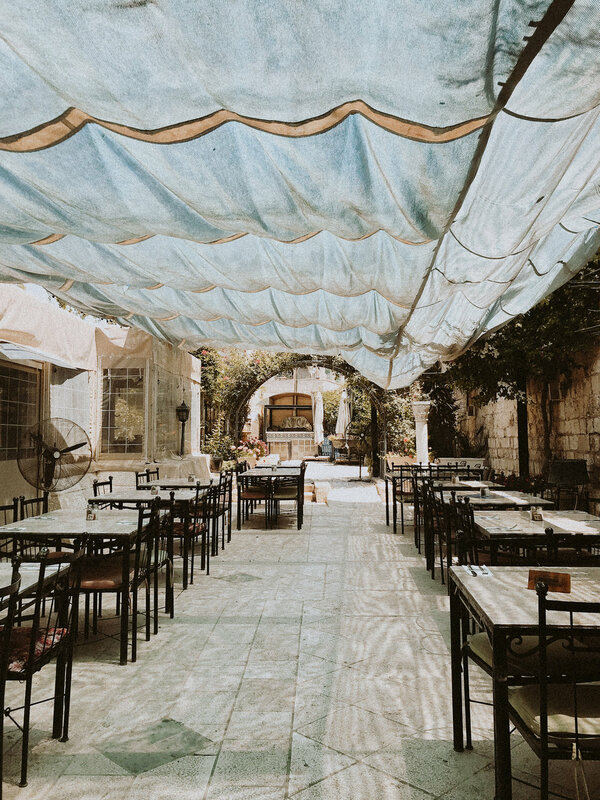 Nafoura is a restaurant located inside the wall of Jerusalem and our table happened to be pushed right up against the "new" wall which was made over 500 years ago. 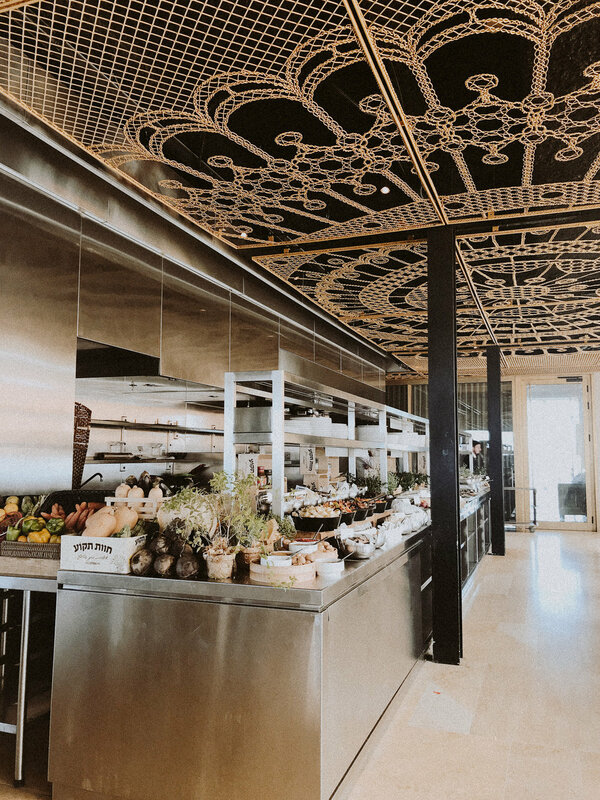 I feel like Nafoura Restaurant was our first real experience with Israeli food. While looking over the menu we noticed that each entrée was served with "ten salads" and little did we know that it was actually ten salads. Luckily we had Daniel there to keep us from ordering enough food to last us the week. The salads included a variety of small dishes including hummus, Matbucha, cabbage salad, Baba Ghanoush, cucumbers, tomatoes, etc. all meant to be eaten with pita bread. We learned that after you have eaten and tasted everything they come and serve you a big plate of meat (if you order the mixed grill), as if you had any more space for even more food. But you find a way to make room because everything tastes SO. GOOD. 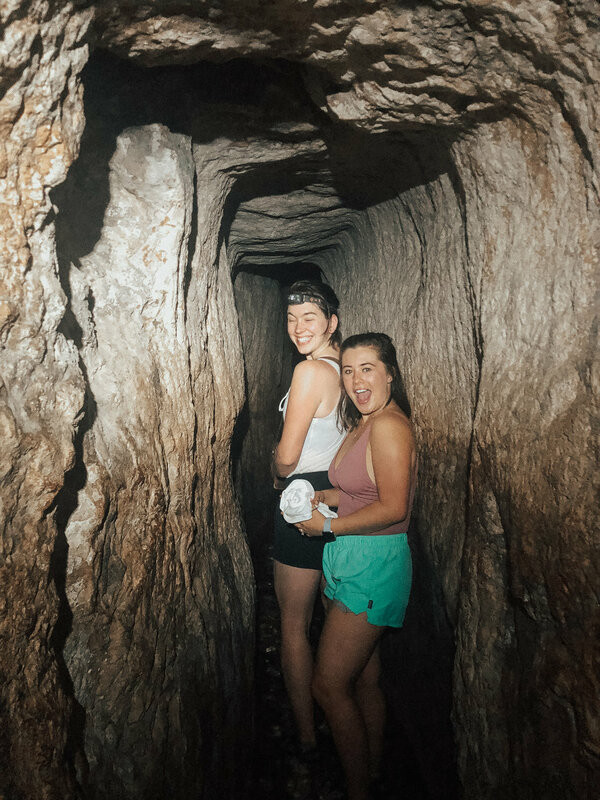 With full tummies and good spirits we made our way to Hezekiah's Tunnel (click the link to read more about this super cool, secret method of getting water into the city during a time of conflict). But first we enjoyed this view of Jerusalem while making our way down. The tunnel is what you would imagine, cold, pitch black, wet and small. There were few places where it could not have been taller than 5' and I would know since my head was just about touching the ceiling a lot of the way. Chelsea, David and I were the ones in our group who went through the cave that we thought was never going to end. According to Wikipedia that cave is less than half a mile long...but it did not feel just 0.4 miles. If you would have asked me how long I thought it was I would have said at least a mile. But at least in my head it was a mile of fun and adventure. While we were in the cave I remember two thoughts I had. One thought we discussed was maybe we were getting punked and this cave was actually miles long and it was going to take us the rest of the day to get out. Or we missed some directions to take a turn and got lost? Which would have been very unfortunate. Another thought that went through my head was how excited I would have been as a child to have found such an incredible hiding spot. I was a pro at hide and seek and loved all small nooks and crannies. Happy that we made it and that we weren't being punked! From the Hezekiah's Tunnel we went to The Garden Tomb (click the link to read about this controversial holy site). Some believe that this is the burial place of Jesus after he was crucified and others say that it was created as a place for prayer and meditation. I personally do not believe that this is the site Jesus was buried because it would not have made sense in terms of walking distance. After Jesus was crucified the disciples had to quickly get Jesus' body down from the cross and buried before sundown, at which point that Sabbath would have begun and they wouldn't have been allowed to do any work. This tomb is quite a distance outside of where the old walls would have been and would have been quite the walk with a corpse. Whether or not this was the true site it was beautiful and I can see why many people come to this place to pray. After visiting the Garden Tomb we were taken back to the hotel with time to explore the city and go to dinner. David and I spent a few hours just walking around and soaking in what this neighborhood that we were calling home for four days had to offer. This adventure of course included flowers and ice cream, as all city adventures should! I spy with my little eye....a kitty! We went to dinner at a restaurant called Chakra that was recommended by a good friend. The food was incredible. This meal did not include ten salads but if you ever find yourself at Chakra in Jerusalem be sure to order the Tuna Bruschetta, you won't regret it. Often times traveling makes me feel small in this big world, and Israel did make me feel small...but it also made me feel dumb and ignorant. I found myself desperately trying to grasp all details of everything that we were learning and felt panicky knowing that I could be forgetting something, or not understanding the significance of certain sites or certain historical events. And even though that sounds like a terrible feeling, despite it all, it was actually exciting, powerful, and intoxicating and all I wanted at the end of the day was more. In fact I had the hardest time sleeping each night and found myself waking up with thoughts still buzzing that were filled with images of what we had done and seen. I had quickly become obsessed Israel. Cheers to a perfect first day that will become a part of an unforgettable week.